CONTINUOUS HOURS OF FUN AND RELAXATION. 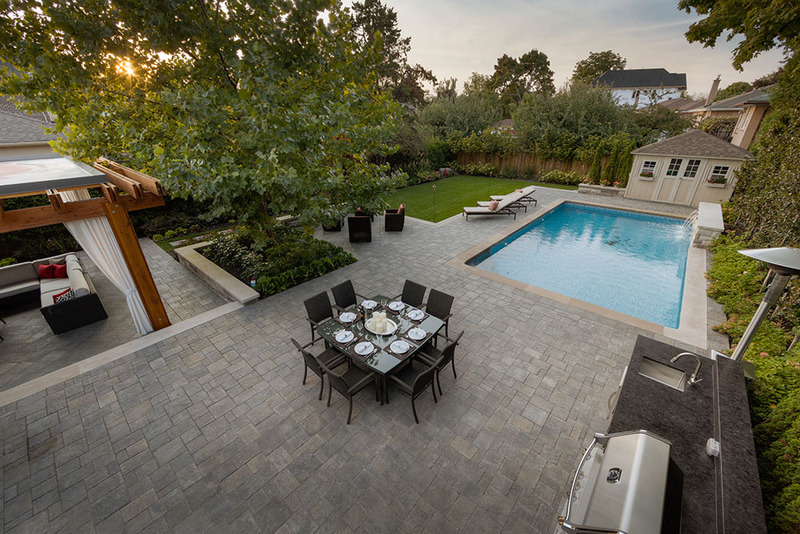 At Darsan Contracting we realize that property owners depend on the knowledge and experience of a qualified landscape contractor who is skilled in carrying out the landscape construction. 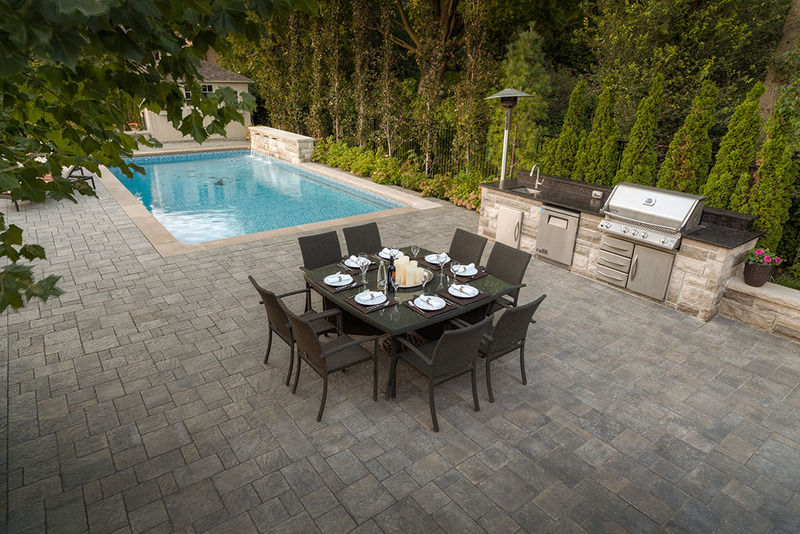 This ordinary backyard was transformed into a fun entertaining space consisting of a cooking and dining area, a pool and two lounging areas. The main patio on the upper level boasts a cooking area with plenty of room for a dining table and lounging seats. A custom Owen Sound barbeque stone surround with granite counter top was constructed which includes a stainless steel sink and fridge. 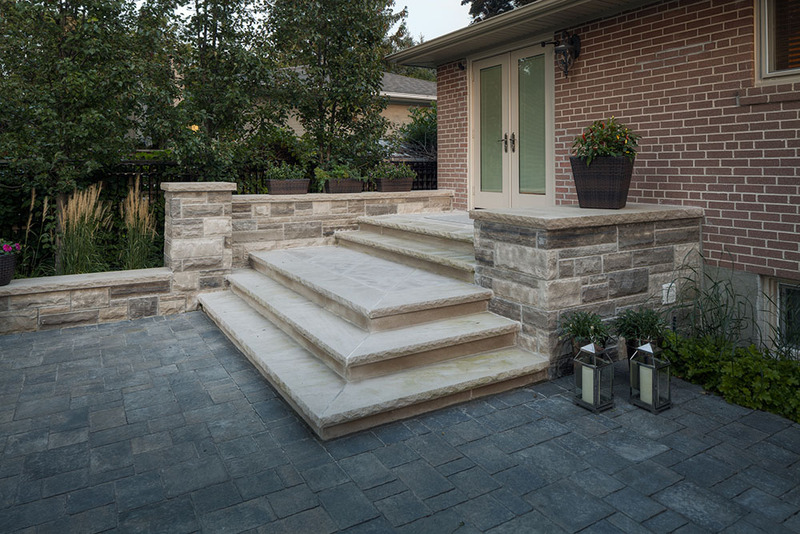 Precast lockstone pavers were laid in a random pattern, bordered with formed and poured steps that were veneered with Indiana limestone. A vinyl lined rectangular shape pool provided continuous hours of fun and relaxation. The water feature wall was veneered with Owen Sound coursing stone and capped with Indiana limestone coping. 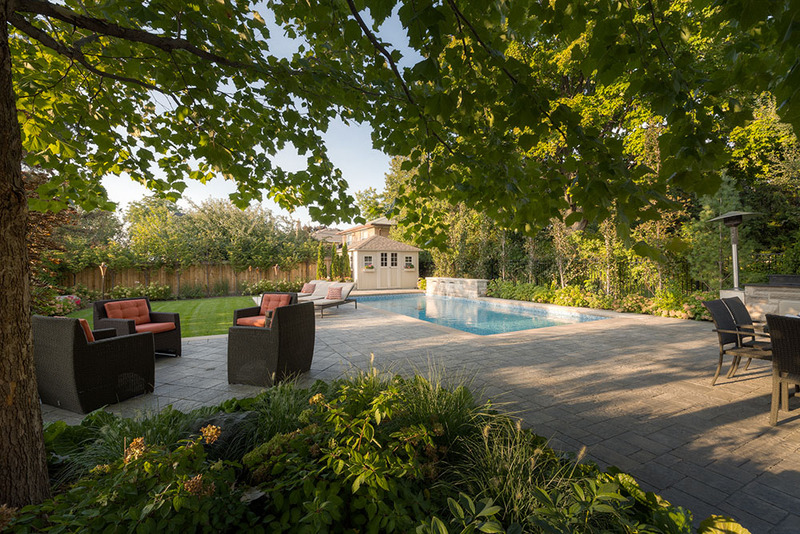 This backyard featured a sunken entertaining area, where a Douglas fir roof provided shade and a sense of enclosure. Garden walls throughout the backyard were faced with Owen Sound coursing stone and steps were in Indiana limestone coping. To add colour, texture and visual appeal, a variety of plants, shrubs and trees were added. When you hire Darsan Landscape Contractors, the finished product will portray the vision the landscape designer and the homeowners imagined.